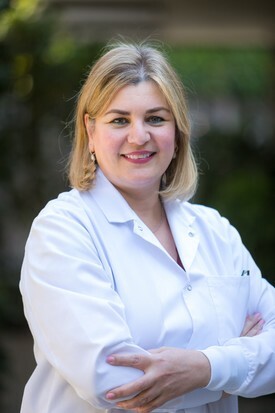 Meet Dr. Roshan Emam, D.D.S. Dr. Emam has been practicing dentistry for over 20 years! Read our interview with her to learn more about why she considers dentistry an art, her favorite dental stories, and her passion for her patients' health and well-being. I always knew that I wanted to be in the healthcare field and help people. I didn’t know which field I was going to go into. I responded to a summer ad to work in a dental office as a dental assistant while in undergrad at UCLA. I enjoyed working with patients because they were scared of the dentist but confided in me as a dental assistant. In dental school, I started falling in love with dentistry. I didn’t see it as a business, I saw it as a way to make a difference in people’s lives. It was my calling! Seeing patients smile when they leave. It’s all about the relationship that you make with people. When I was younger, for me, it was about the events that happened. I made a beautiful crown, a patient has a brand new smile. Now as I get older it’s more about the relationship, the trust that’s built with the patient, and being able to see them evolve through the experience. Even though the work is external, good dental health and pride in the outcome affect everyone internally as well. They’re more confident, happier and start taking better care of themselves. If I have to look at it scientifically - I’d say there is often a bad experience they had as a child. We’re most afraid of the unknown. We encourage patients to always ask questions. We try to show patients photos and go over details of the treatment so they can learn about what caused the problem, what needs to be done, and what we can do to prevent it in the future. This process prevents some of the fear. I’m also gentle and give painless injections! I see it as an art and a science. It’s mostly art. For example, imagine the mouth as a painting with watercolor in areas, oil in others, black pencil, a mixture of materials. It’s the same thing, but instead inside a mouth, it’s metal fillings, white fillings, crowns, framed by the gums. That’s how I see it. You go to a gallery and you see paintings that are done and inspiring and they relay a message to you. When it’s beautiful to look at and it’s framed well, it has an impact on your life. It’s the same thing with a mouth full of beautiful, healthy teeth and gums! After your initial visit where I take photos, I sit down and study the photos at length, look at your smile, and read over your new patient interview questions. I try to come up with a plan that fits your concerns and needs. A lot of time goes into that report! Then we sit down together and co-diagnose and co-discover. I want you involved in the process! Whenever any specialists are involved, there are lots of behind the scenes calls, emails, and meetings. Meeting up with the lab on a case, meet with a surgeon so we’re all on the same page. I’m like an architect who wants to build a house. A lot of time that goes into measuring the land, looking at where you want the kitchens to go. By the time you start the work, you have the end in mind. I look at the overall picture of how everything fits together and come up with the master plan. How is dental care related to overall health? They say eyes are the window to your soul, but your mouth is the window to your overall health. This is where we introduce food and nutrition to the rest of our body. Not properly removing that bacteria can affect the rest of the body, lungs, heart, and kidneys. Lots of research is being done about how dental health and dental bacteria is related to diseases, from Alzheimer’s, diabetes, heart conditions, premature births, and so on. Those two minutes a day you spend brushing and flossing can add many, many years to a healthy life! We’ve noticed that you [Dr. Emam, Faby, and Cindy] are like family. Why do you think the three of you are such a great team? The main thing that brings us together is our common goal. We’re here to make a difference and we care about our patients. Based on that, we built the rest. We take pride in what we do. I think we see you as an individual, someone with a soul and a heart, not just someone with a mouthful of 32 teeth! What goals do you have for your patients? For them to keep their teeth for a lifetime! To enjoy a lifetime of happy, healthy, beautiful smiles! To ensure that they can smile, be confident, function, chew food, and enjoy their lives with minimal pain, discomfort, and dental treatment. I was the third year in dental school and I was in charge of the emergency clinic. A patient showed up and said she had a hard time removing her dentures. I put on gloves, start examining her teeth and I’m thinking, “These are nice solid dentures! How did they make them?” I tried to remove them and couldn’t. I started asking her questions: “Did they always fit this well?” She said she had been using denture adhesives, but they didn’t work and the dentures wobbled all over the place. So she had glued them to her mouth with crazy glue! She had to have surgery to remove the dentures out of her mouth. I’ll remember that for the rest of my life!! Do you have a lucrative business contract with the Tooth Fairy? 50/50! She keeps the teeth, I keep the money!